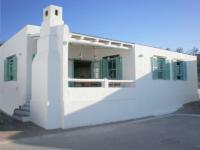 This tastefully decorated cottage is located in the charming seaside village of Paternoster on the West Coast. The house comprises three bedrooms and two bathrooms, and features include an indoor fireplace, underfloor heating, heated towel rails, and barbecue facilities. •	High Season (incl Easter & Jazz festival): check-in is strictly at 15h00, unless otherwise arranged with the office. •	A surcharge of R200 per hour or part thereof will be charged for any arrival later than check-in time as indicated above. This surcharge is deductible from the Key & Breakage deposit. The guest consents to this deduction. Beach: The property is just a few minutes from the beach. Please note that we require your cellphone contact number after confirming a booking, to enable us to give you additional information relating to your booking. will be bound by these Terms and... Please note that we require your cellphone contact number after confirming a booking, to enable us to give you additional information relating to your booking. Please ensure that the outstanding balance is paid at least 7 working days prior to arrival. Should a booking be made less than 7 days prior to arrival, the full amount is payable as deposit. Kindly forward proof of payment via e‐mail or provide on arrival. other unsatisfactory state. Please furnish us with your banking details on arrival for the refund. Public Holidays). No check‐ins will be entertained on Christmas day, Good Friday or New Year's Day. A surcharge of R200 per hour or part thereof will be charged for any arrival later than check‐in time as indicated. This surcharge is deductible from the Key & Breakage deposit. The guest consents to this deduction. deposit. The guest consents to this deduction. petty theft does happen when given the opportunity. The crime, which targets small high-value items like wallets, cell phones, iPods, laptops, GPS’s, cameras and binoculars, is generally not violent. We strongly advise that all windows and doors are shut and locked and alarms armed when you leave the unit unoccupied. Please also ensure that doors & windows are closed and locked at ground level and all vulnerable areas. Should the property have outside beams and stay/sleep functions, please take care to activate these at night. Also take valuables from your car into the house or lock in your boot. during the day. If you do purchase crayfish, rather do so at the fish market where no one gets close to your property. Remember that purchasing and being in possession of crayfish outside season is illegal and carries a severe fine.These simple measures should go a long way to safeguarding your personal belongings and possessions. Please note that all our rental units are Self Catering therefore we ONLY provide a starter kit of toilet paper (one roll per bathroom), a small amount of washing up liquid and/or two dishwasher blocks and two rubbish bags. Pleasebring or buy your own wood. Unless otherwise stated, units are not serviced. If you would like to request a cleaner during your stay please contact the Stay in Paternoster office. This will be a separate arrangement, and cleaners can be paid directly in cash.During a longer stay, linen and towels will only be replaced after 7 nights, due to the current drought in the Western Cape. The house will not be serviced, only fresh linen provided. Should guests require clean linen before 7 nights, it will be for their own costs. A booking will only be confirmed once the full deposit amount and key & breakage deposit have been received. The balance is payable by electronic fund transfer or credit/debit card 7 days before arrival. No keys will be handed over if full outstanding balance has not been received. accommodation should the need arise, for reasons beyond our control and not due to our negligence. guest. The guest consents to this deduction. bachelorettes or spit braais are not permitted. neighbours, failing which you will be asked to vacate the premises. Bring along your own food, drinks, beach towels and wood. result from this agreement. Stay in Paternoster CC legal costs will be charged as attorney & own client costs. Thank you for your booking. We do hope that you will have a relaxing stay. Absolute nothing to improve. We enjoyed every minute of the stay, friendly staff and accommodation. Loved the view. Comfortable and cosy. Suited the entire family. Will definitely be back. Good views. Short walk to the beach. Wonderful. The accommodation was great and very welcoming. Malmok is 0.6km from the centre of Paternoster , the nearest airport 151km (Cape Town International Airport).